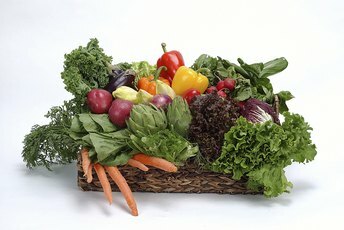 What Are Some Lean Protein Meals? Chicken breast is a lean protein meal. Protein, which makes up every cell, tissue and organ in the body, is an important part of a healthy diet. 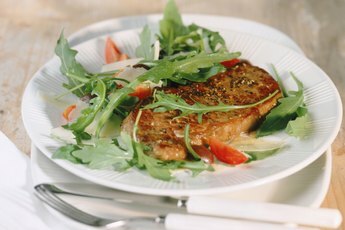 Lean protein meals are not only a good source of protein, they also do not add too much fat or calories to your diet. A lean protein includes 1 to 3 grams of fat and 50 to 55 calories per ounce. Adult males need 56 grams of protein per day and adult women should consume 46 grams of protein per day, according to the Recommended Dietary Allowance. Fish has a number of health benefits. Many types of fish and seafood are low in calories. Fish also is a good source of protein, omega-3 fatty acids and other essential nutrients. The exact nutrition of fish depends on the type and the way you cook the fish. The leanest fish are white fish such as tilapia and flounder and most shellfish. Other fish like tuna and salmon are still lean and also contain healthy fat. A 3.5-ounce serving of tilapia contains 26 grams of protein, 2.65 grams of fat and 128 calories. Chicken and other poultry are a good source of protein. Poultry, which includes turkey and Cornish hen, are low in both calories and fat. Like fish, the exact nutritional information will vary depending on how you prepare your poultry. To ensure that your poultry is lean, eat poultry without the skin. 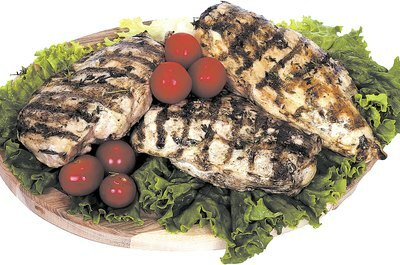 Bake or grill chicken instead of frying to reduce the fat content of your meal. A 1-cup serving of chopped, skinless, roasted chicken contains 266 calories, 10 grams of fat and 40 grams of protein. Although you normally associate beef with saturated fats, certain cuts of beef are lean. In general, white meat such as fish and poultry are healthier meats. However, 29 cuts of beef meet the USDA regulation for lean or extra lean meat, according to Mayo Clinic. The extra lean cuts include eye of round roast, sirloin tip, top round roast, bottom round roast and sirloin steak. Choose select and choice cuts of beef over prime, which has more fat. Also be sure to trim any visible fat off the meat before eating. There are other excellent sources of lean protein. Eggs are the highest quality protein. A regular size egg contains 70 calories, 5 grams of fat and 6 grams of protein. You can make a meal with an omelet or a poached egg. Dried beans and legumes are high in protein and low in calories and fat. 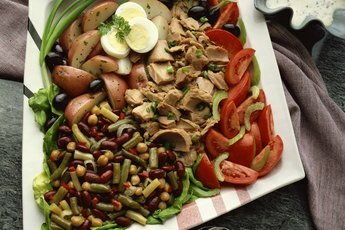 Include lentils, soy products or dried beans or peas into your meal to increase protein without affecting your waist line.